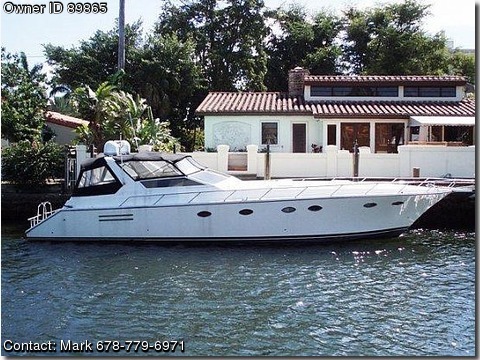 ac/heat, am/fm stereo cd, anchor, bimini top, 5 bilge pumps with high water alarm, bow pulpit, camper top, new carpet, coast guard pack, cockpit cover, compass, 2 depthfinders, dockside power, full gauges, galley, generator westerbeke, gps chart plotter, halon, head, hydraulic steering, knotmeter, radar, radar arch, refrigeration, shower seperate BOAT OWNER’S COMMENTARY: This exciting Italian designed express cruiser is made after the legendary Riva design. She is 50’ of Italian design excitement. Interior has been updated recently and appears new and in good condition. Contemporary colors and fabrics were used to obtain an elegant European look and feel. Her sleek lines and spacious cabin make her perfect for cruising. This boat has fantastic use of space. Her reliable 450 HP Turbocharged Detroit Diesels make her economical to run and can get from point A to point B in a hurry. As you enter the Aft Deck from the Transom, there is ample sofa seating in bright white to port and to starboard. Just forward to port is a wet bar and icemaker and cabinet storage. Opposite to starboard is the steering helm with high bench seating and back rest with easy view of the bow through windshield. This aft deck area offers a complete enclosure with canvas and isinglass for protection from the weather as well as maintenance free storage. Entering the centerline companionway down three steps into the spacious Main Salon you are instantly welcomed by the lightness of off white flooring with matching L-shaped leather sofa and settee. Forward to port is the entertainment console with complete Panasonic combination audio video in stereo surround sound. The Galley area to starboard offers white cabinetry, ample countertop space with hideaway sink, fridge, and kitchen functionalities. Proceeding forward there is a full Head to starboard with large stall shower with marble, and 2 port lights. To port is a Twin Guest Stateroom with cedar lined closet and full length dressing mirror. Walking forward is the Master Stateroom with centerline Queen Berth. The mirrored dressing table with vanity/desk has a swing out cushioned seat. The bulkhead is custom upholstered with mirror and matching draperies, bed cover, and pillows. There is a fully lined cedar closet and an off white seating area to port and starboard.